"Martyn Ould has re-invented process modelling for the real world. Throw away pre-conceived ideas of wall-to-wall reengineering charts, workflow diagrams and arcane application logic. The author shows us that processes are participatory, concurrent and mobile. Their underlying formalism is interactive role-based computation. With the advent of Business Process Management Systems (BPMS) this important book is essential practice for those modelling processes." Re-engineering or creating new business processes or organisational structures? Need to identify IT solutions involving workflow, document management or Business Process Management systems? Preparing process definitions intended for a Quality Management System? If the answer is ‘yes’ to any of these questions, then you need a copy of Martyn Ould’s Business Process Management: a Rigorous Approach. Businesses need to adapt constantly in order to remain competitive, but are often held back by static IT systems that aren't designed to change with the business. The challenge is to create systems that can. Business process management (BPM) is an important emerging technology that overcomes this problem. With the advent of the technology, new methods are required to exploit it effectively. Riva is a pioneering method addressing the major emerging technology of Business Process Management that is business-focused. It is a method for designing, modelling, analysing and recording business processes. It is about modelling organisational behaviour in a way that is revealing and communicative, showing exactly what processes there are and how they interact. The architecture is derived from an understanding of what business the organisation is in, rather than its current structure or culture. Once the architecture is understood, it becomes apparent what is required from the IT systems supporting these processes. The sorts of process models that Riva generates are designed to be of real practical use in a number of BPM situations, whether that’s the reengineering or re-design of business processes and operations in a radical change or for improvement in an incremental change or somewhere in-between. The methods described in Business Process Management: a Rigorous Approach work on a business level, but they are IT orientated, making it essential reading for both IT people involved in understanding business processes as a first step in developing requirement for IT and BPM solutions, and for business-focused people involved in requirements definition, or engaged in process improvement or process design work. 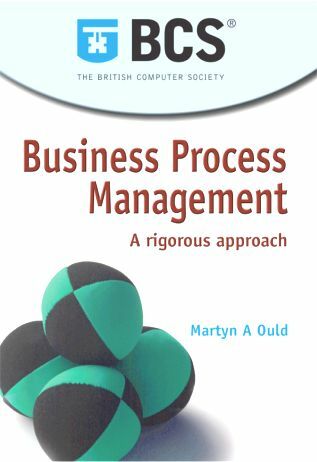 Business Process Management: a Rigorous Approach is an in-depth practical guide divided up into two parts. The first builds up the theory, with lots of examples from real life, while the second puts the theory into action, showing use in process discovery and definition, diagnosis and improvement, design, support and enactment. * With its roots in business theory, rather than software development, the Riva method has gained a reputation for addressing the business aspects of processes in a way that is accessible by the everyday user, whilst giving the analyst powerful tools for process understanding, diagnosis and design. * Riva is a pioneering method addressing the major emerging technology of Business Process Management. * Riva addresses current industry concerns over the quality of support given by IT systems to a business and the recognised need to be able to represent and think about business processes in a rigorous fashion. * Concern about business processes has become more prevalent in the wake of increased interest in BPR, TQM (Total Quality Management) ISO 9001, and enabling technologies such as ERP and workflow management.Business Process Management: a Rigorous Approach can help. Which things do we model and which do we leave out? What are the features of real-world processes that we want to reflect in process models? Provides all the ‘vocabulary’ necessary to represent a single process in a Role Activity Diagram (RAD). Highlights the levels of in-process concurrency that can be captured in a RAD. Examines the types of dynamic relationship that processes can have and illustrates how we represent them on RADs. Describes the three main types of process – case process, case management, and the case strategy process. Describes how to construct the process architecture of an organisation, a concept of central importance for reengineering, for overall process design and for steering process initiatives. Shows how the process architecture captures all the between-process concurrency in the world. Provides guidance on running a process workshop and conducting interviews in order to prepare a model of a process, for whatever reason. The practical use of the approach in determining what processes an organisation has, in eliciting those processes (onto RADs) and in the use of RADs in Quality Management Systems, tying into ISO 9001. Covers using the approach at both the architectural and the process level for asking questions about processes and their performance and for driving tactical process improvement. The design of a new process architecture and new processes starting from a blank sheet of paper. The role of the approach in constructing an IT strategy for an organization and in the design of traditional information systems. Covers the role of the approach in developing Business Process Management systems in which agile and mobile processes replace static data structures. Martyn Ould read mathematics at Cambridge University and entered the software industry directly in 1970, working for several years for ICL on operating systems. After a short spell at King’s College Hospital Computer Centre, he worked for eleven years with Logica, principally on real-time systems, as developer, designer, and project manager. In his last two years there he co-founded a company-wide software engineering initiative and wrote his first book A Practical Handbook for Software Development (Cambridge University Press, 1985 and 1988) with Nick Birrell. His second book, Testing in Software Development (Cambridge University Press, 1986 and 1988) resulted from work carried out by the BCS Testing Working Group. In 1985 he joined software house Praxis where he became Quality and Technical Director, with responsibility for the company’s quality policy and strategy and its overall technical strategy. He developed a systematic planning technique – Strada – for software engineering projects described in his fifth book Managing Software Quality & Business Risk (Wiley, 1999). At Praxis he consulted for clients on the software engineering process, specialising in project audits and rescues, reviews of software development methods, and risk management. He continues this work as an independent consultant, and teaches Strada on graduate and undergraduate courses at Oxford and Bristol Universities. At Praxis he led the development of the STRIM method for business process design and diagnosis described in his fourth book Business Processes (John Wiley, 1995). He has recently extended this to the full-spectrum business process management method – Riva – described in this book. Following the merger with the Deloitte & Touche Consulting Group, he was a Senior Manager within the global firm. He became an independent consultant in 1998 and now consults in business process management and provides training in Riva. He has contributed numerous articles, reviews and papers to the computing press; lectured to public, government, university and corporate audiences; and acted as a referee for national research programmes, conferences and journals. He is a Fellow of the BCS and a Chartered Engineer.